Developed in 1996, DeviceLock is a leading provider of endpoint device/port control and data leak prevention software for business, education and government institutions around the world. A clear leader in endpoint DLP with over 70,000 licensed customers who’ve deployed on over 7 million endpoints (laptops, desktops and servers) DeviceLock enjoys a global customer presence across a wide variety of business types including: banking and finance, medical, pharmaceutical, government and defense, manufacturing, retail and more. Based in San Ramon, California (35 min. from the heart of Silicon Valley), the company is privately owned and has been financed entirely by its founders and through retained earnings. DeviceLock is an international company with personnel in California, Vancouver, London, Düsseldorf, Milan and Moscow. DeviceLock is a profitable, fast-growing business and is audited by Grant Thornton. Developed in 1996, DeviceLock DLP is a leading provider of endpoint device/port control and data leak prevention software for business, education and government institutions around the world. A clear leader in endpoint Data Loss Prevention (DLP) with over 70,000 licensed customers who've deployed on over 7 million endpoints (laptops, desktops and servers) DeviceLock enjoys a global customer presence across a wide variety of business types including: banking and finance, medical, pharmaceutical, government and defense, manufacturing, retail and more. The company is privately owned and has been financed entirely by its founders and through retained earnings. DeviceLock is an international company with personnel in Moscow, Russia, California, Vancouver, London, Dusseldorf and Milan. DeviceLock, Inc. is a member of the Microsoft Independent Software Vendor Program (MSDN ISV), the Intel Software Partner Program, the Fujitsu Siemens Computers Global Alliance, the Sun Developer Connection Program (SDC), and the Citrix Developer Network. With its more than 20-years history on the international market, DeviceLock DLP has thousands of customers in more than 100 countries. Historically, they came from data security sensitive industries - including Financial, Government, Defense, Defense Contractor, Health Care, Energy, Bio-Tech, Manufacturing, Education and Resorts & Casinos. 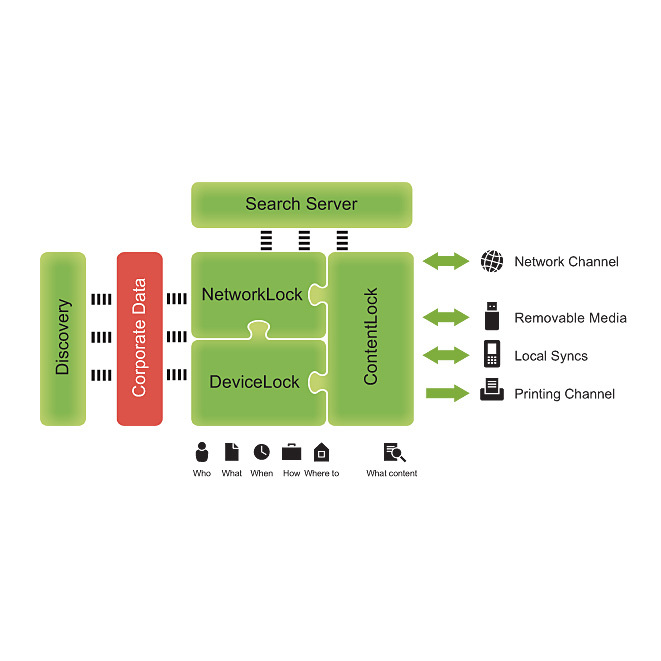 DeviceLock DLP is designed as a modular architecture of standalone-feature products with add-on components whose functional capabilities are complementary to each other while their management is unified and licensing for modules other than Core is optional. As a result, these products and components can be used in various combinations, thus allowing DeviceLock customers to choose cost-optimized solutions with only those functions necessary to satisfy their current security and/or budgetary needs. This modular architecture enables customers to incrementally upgrade the functionality of deployed DeviceLock products as their data protection requirements grow from the basic device/port control Core option up to the all-inclusive content-aware Endpoint DLP Suite solution. 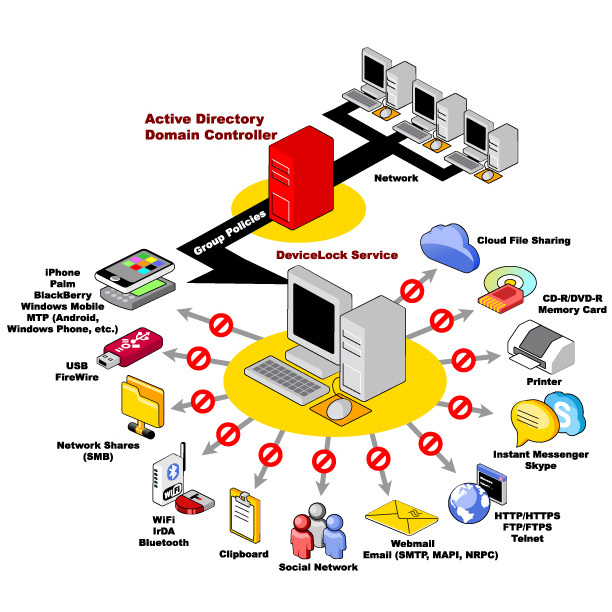 The full DeviceLock Endpoint DLP Suite prevents leakage of data when they are used and moved locally on protected endpoint computers, as well as when the data are transmitted from corporate endpoints over network communications. Therefore, the Suite implements the functions of "data-in-use" (DIU) and "data-n-motion" (DIM) leak prevention. The Suite's fundamental component and basic standalone product option is DeviceLock Core. It enforces fine-grained contextual controls over data access and transfer operations locally on the protected computer. These include user access to peripheral devices and ports, document printing, clipboard copy/paste operations, screenshot capturing, media format and eject operations, File Type Detection access controls, as well as synchronizations with locally connected mobile devices. It is important that DeviceLock Core includes the framework for all central management and administration components of the entire Suite, and therefore must be used in any Suite installation. Another Suite's component called NetworkLock is an optional add-on module which can be used together with DeviceLock Core to extend the Suite's security functions with contextual controls over network communications of protected computers through often risky applications and protocols. These include popular email platforms, webmails, Instant Messengers (IMs), cloud-based file storage, social media, web access, local network shares, torrent P2P file sharing, as well as FTP and Telnet protocols. The third functional component - ContentLock, which is also an optional add-on to DeviceLock Core, performs content inspection and filtering of files and other data objects.